All drivers are hopefully aware of the majority of well-known driving laws such as speeding for example – you drive over the speed limit, then you might expect a fine if caught. However, there are some laws that are a little less known and may result in some drivers unwittingly breaking the law. Let’s take a look at some of the more obscure and perhaps weird driving offences. There may be one or more laws you have broken without even realising. It’s not illegal to use your phone to pay for food at a drive-through, but if your engine is running, then you’re fair game for prosecution. Many drivers are under the impression that if your vehicle is not moving; you’re stopped at traffic lights or stopped in a lay-by for example, then it’s legal to use your phone. In fact, if you are on a public road, or a road that has access for the public to use and even if your vehicle is stationary, then your engine must be switched off. If you’re unfortunate to get caught, you’ll be looking at a £200 fine with 6 penalty points. It used to be as simple as letting your dog hop onto the passenger seat and be on your way for a car journey. Based on a survey conducted by The Dogs Trust, some 48% drivers are either unaware of a change in the law, or simply choose to ignore it. 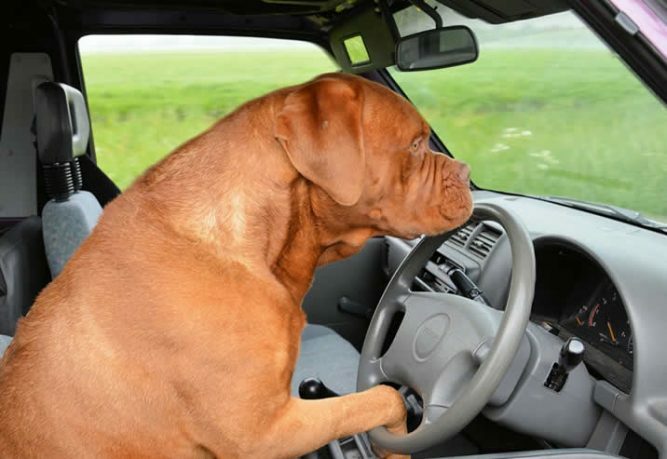 Dogs should be suitably restrained in a car for their own safety (in case of heavy braking) and for the drivers safety to prevent distraction. Restraint should be in the form of a harness for the rear seat or a dog guard or crate if securing your pet in the boot. Other small animals should be kept in a pet box. This offence falls under the penalty of ‘distracted driving’ and will typically see a driver hit with £100 fixed penalty along with 3 points. Driving too slowly might seem like a slightly weird offence because unlike speeding, there’s no specific law for it except perhaps for the odd tunnel (see minimum speed limit signs). Motorists that drive unnecessarily slow can be annoying for may, but it’s when it becomes a danger that the police can step in. When joining a dual carriageway or motorway safely, a driver should match the speed of the traffic that they wish to join. Joining at a much slower speed than other traffic is clearly dangerous. Likewise, driving unnecessarily slow on an otherwise safe stretch of road may be construed as dangerous if it causes other road users to take potentially hazardous action to pass. Penalties for driving too slowly can range from a verbal warning, through to a court issuing 9 penalty points and up to £5000 fine. It’s easy to neglect cleaning our cars, particularly in the wet and cold Winter months, but if your number plates get too dirty, you could be faced with up to £1000 fine. This also applies to faulty number plate lights. You may have inadvertently driven through a puddle and splashed a pedestrian in the past, but did you know that under British law it’s illegal? Under the Road Traffic Act 1988 ‘driving without reasonable consideration for other persons’. A driver caught doing so can face a fine of £100 along with 3 penalty points on their licence. If the case goes to court, the fine can amount to as much as £5000, potential disqualification and up to 9 penalty points. We’ve all seen a speed trap van or a police officer holding a radar speed gun and likely been warned of the impending ‘trouble’ ahead by another motorists flashing their headlights. Or perhaps you have warned another motorist by flashing your headlights? But did you know that it’s illegal to do so? Essentially it falls under the offence of “obstructing a constable in the execution of his/her duty” and comes with a potential fine of up to £1000. Angry drivers that vent their frustration in the form of a rude hand gesture could face a fine of up to £1000. The offence falls under the Crime and Disorder Act 1998, where angry motorists can be fined up to three quarters of their weekly salary, which is capped at £1000. We’ve all seen it in the movies – traffic jams with motorists hitting their horns in frustration. Not quite sure how doing that’s supposed to help the situation, but here in the UK it’s illegal, other than to alert another driver of a hazard or danger. It’s also illegal to sound your horn whilst driving in a built-up area with street lights and a 30mph limit between the hours of 11.30 pm and 7.00 am. This can see a driver hit with a fixed penalty notice of £30, or if the matter escalates to court, a maximum of £1000. See car horn laws for further information. The same offence of using a mobile device whilst driving also apply to using an unsecured mobile phone for a sat nav. Unless you want to risk a £200 fine and 6 penalty points, you’re better of purchasing a holder that securely attaches your phone to the dashboard or windscreen. If the case goes to court the fine could rise to £1000. We all remove snow from our car windows, but what about the roof? Leaving snow on your car roof might seem like a slightly weird law, but it falls within section 229 of the Highway code: “remove all snow that might fall off into the path of other road users”. Under braking, the snow may slip forward obscuring your view of the road ahead. That bit of snow on your roof may end up costing you £60 along with 3 penalty points.